In 2006, the explosion from the Sago mine disaster in West Virginia trapped 13 miners and killed 12. Miners could not find their way out after the explosion, so they waited for rescue. Although the SCSR (Self-Contained Self Rescue) device all miners carry are supposed to give them about an hour of oxygen, at least four did not work, as described by Randal McCloy Jr, the lone survivor . Follow-up investigations showed that the devices were perfectly functional, but because it was very difficult to deploy, some miners probably thought their SCSRs were broken . The Upper Big Branch mine disaster a month ago was the biggest mine disaster since the 1970s. 25 miners were killed by the initial methane blast. Of the four remaining miners, authorities hoped that they had somehow made it to safety chambers supplied with oxygen, food, and water. Unfortunately, those four miners never made it to the safety chambers and their bodies were recovered four days later . Human factor investigations cited the miners’ inadequate emergency training as one of the biggest faults. Training for the SCSR device was administered through video. Evacuation drills of the mine were completed under perfect light and perfect oxygen . Trainees were never physically, cognitively, nor emotionally challenged. It’s not a surprise that this kind of “fake” training did very little to help miners survive a real emergency. There was a huge gap between what they learned and what they faced in a real emergency. Games can help bridge that gap. How Can Games Help with Training? The two terms “games” and “training” sound like oil and water at first. After all, games should bel “fun”, and training sounds awfully boring. However, if we take a step back and look at a game’s basic structure – an operating model made up by rules that players interact with — then the two are pretty similar. Isn’t the leveling up process in a RPG analogous to training? Doesn’t hard-earned success taste sweet, regardless of whether it’s for sport or for work? In 2009, an experiment was done to see if video games can help business students learn. The study showed positive, quantifiable results on behalf of the games . More students got A’s and B’s when they played the video game. But that was in a classroom for a bunch of college students. Will games also work in in coal mining for a group of hardened miners? 1. Gameplay builds and reenforces the player’s mental model. 2. Games provide a risk-free environment for exploration and mistakes. 3. A game’s time and space is virtual, so the material can be structured in a way that’s best for learning. Before taking a closer look at how game design can help training, it is worthwhile to differentiate a training game from an educational game. (Strictly speaking, the business class experiment mentioned above is an educational game, not a training game.) While both types of games aim at communicating real-world information to the player, training games are more application centric. Perhaps the difference is better explained through examples. 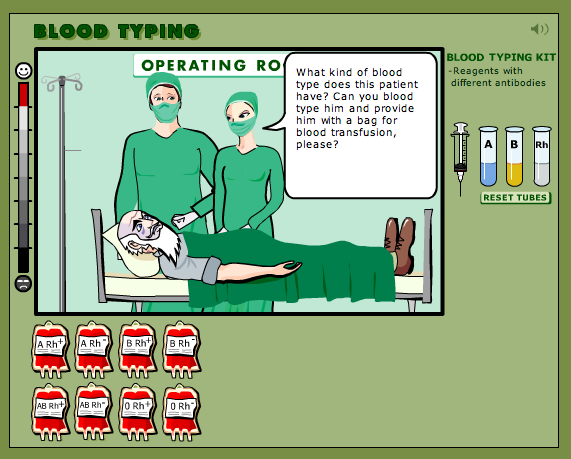 The following is an educational game from Nobelprize.org, about blood types. The designer of the Blood Typing game didn’t design it for physicians or even medical school students. Players of this game are likely casual and do not expect to put the knowledge to practical use. Learn the concepts behind Karl Landsteiner's Nobel Prize winning work from 1930. 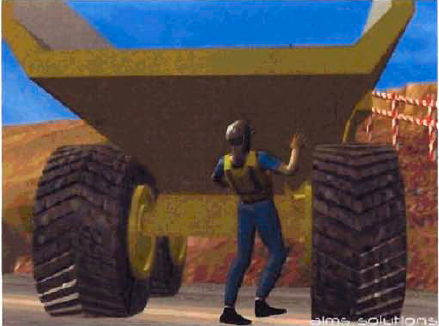 The second example below is a screenshot from another training game developed by NIOSH for mine safety. The target audience here is exclusively miners. It is designed to train miners to do every day tasks as well as respond to emergencies. The first thing games can help with is the mental model. If the miners’ don’t have a correct mental model of how the SCSR device works or how the mine is laid out, they are not likely to respond correctly in case of emergency. Games can help create the correct mental model in two ways: building and reenforcement. When forced to learn, people learn very little. The fun elements of training games encourage people to participate. For audiences like miners, playing a virtual reality game probably sounds a lot more appetizing than a day-long workshop. Of course, The “game” name is only enough to get people’s attention — good game design concepts like flow are needed to keep players playing. The game can’t simply be a rote, electronic version of the material. Instead, it should be a lot more like an adventure game, complete with goals, obstacles, and rewards. Like learning the maze of a dungeon, players will learn the maze that is the mine they work in. Like the 15-step process to obtaining the ultimate weapon, the rescue team (the game can be for miners and rescuers alike) will learn how and where to look for survivors. A multi-player game can further help players learn how to cooperate with each other, like what to do if one person is injured (thus slower) or has defective equipment. Watching a video is passive. Even physically participating in a drill is passive unless players are cognitively challenged. In a game, players will solve problems after problems until the correct mental model takes root in their heads. Another win for using games for training is the low risk. Players don’t have to subject themselves to toxic gases or dangerous landscapes learning how to escape after a mine fire. Moreover, when players are unsure, they can explore and make as many makes as needed. It is better that the exploration and mistakes happen during the game rather than in a real emergency. The first approach is probably better for novice players because novices will make more mistakes and will do better if mistakes are corrected early and in-context. The second approach is better for experienced players or critical tasks (like a boss fight.) Here’s an example of the second approach: The mission is to escape from the mine after a fire and the player is supposed to locate a safety chamber along the way to get an additional SCSR, because the one he has on him won’t last. If the player misses the chamber or is not paying attention to the O2 level, the system will not remind him. It’ll tell the player about the missed opportunities after the “game over”. Compressions of time and space make experiential learning feasible and more salient. Players don’t have to wait for that ” once in a blue moon” occurrence in order to how to respond to it. And regardless of the rarity of the event, players can train as much as they like. Because games don’t care about real time, players can progress from easy to hard tasks as they train. Real life may not be so thoughtful. It terms of game flow, rewarding the players early as they complete the easier tasks encourages them to keep playing. Also in the real world, people may not be cognizant of the consequences of their actions because the consequences happen much later or happen much further away. A game can compress space and time to make those consequences more visible, but we must be careful. In adventure games we sometimes see how hitting a switch in one room will cause the camera to move to a different room, where a door would open up. That doesn’t make sense at all in real life, so this isn’t the type of time and space compression we’d want to see in a training game. In a training game, it is more appropriate to show how a small gas leak can turn into big trouble over time. Another example of appropriate space compression would be distances — a path that takes 20 minutes to walk through in real life would only take 20 seconds in the game. This kind of time compressions will keep players from becoming bored. What is not OK to distort? The oxygen level along that 20 minute walk. Although it would only take 20 seconds of gameplay to traverse the path, the decrease in oxygen level should reflect a 20 minute walk. Games can’t take away the inherent dangers of mining, but they can improve people’s chances by bridging the gap between training and emergency response though mental model development, risk management, and time-space compression. Although games can’t substitute all training (there’s still nothing comparable to learning from a mentor or learning how to put on a SCSR device in real life), it can only become more powerful as technology improves. An ideal training game should make use of all five of the player’s sense. You are currently browsing the Duckywu's Blog blog archives for May, 2010.